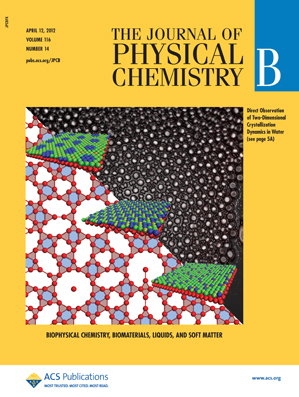 On the Cover: Direct observation of two-dimensional crystallization dynamics in water. Direct observation of crystallization dynamics in real space is of special interest to scientists in various disciplines. Unidirectional packing of microbeads in a confined channel served as the experimental model system because their dynamics can be observed and recorded readily in the laboratory as a result of their large size and slow time scale. Formation of grain boundaries, disorder–order transitions, and height-dependent polygonal tiling are all captured using this platform. Z. G. Chen, Z. P. Xu, M. Zhang, Y. Zhou, M. Liu,T. Patten, G.-Y. Liu, H. Li, X. C. Zeng, and L. Tan. 12 April 2012. Two-dimensional crystallization of hexagonal bilayer with moiré patterns. J. Phys. Chem. B 116(14), pp 4363–4369. Xiao Cheng Zeng is Ameritas University Professor in the Department of Chemistry and professor in the Nebraska Center for Materials and Nanoscience. Hui Li is a postdoctoral researcher in the Department of Chemistry. Li Tan is associate professor of mechanical & materials engineering and associate professor of chemistry. You Zhou is research professor of veterinary & biomedical sciences in the Center for Biotechnology.